"What? You talkin' about us?" As I mentioned a couple of weeks ago, we finally finished construction on our new sheep barn. It took a bit longer than we had planned.... Hubby was only halfway finished with it when hay cutting time rolled around in June, so he had to put the barn on hold until the hay was taken care of. So, finally- here is their new home! This is the upper side facing our house- as you can see, they have a large open "porch" to lay in and catch a good breeze on a windy day. This is the view out into the pasture. There is a large gate that you can't see in this picture that closes this off at night to protect them from predators. 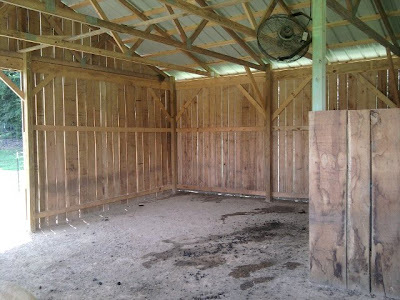 This is the unfinished "back room".... in a few months this will be sectioned off and fixed up for the cold winter nights with some warm straw bedding- but for now it looks like they're using it for a... uhhh... bathroom. The sheep are very happy about their new fan... however, it has been running non-stop this summer. Best of all is when the sun sets in the evening, and the sheep come out to eat their evening meal.... Hubby and I can sit back and enjoy watching them and feel happy in our hearts that we've given them a comfortable new place to live. Next post- this years' honey crop! Happy Wednesday, everybody! 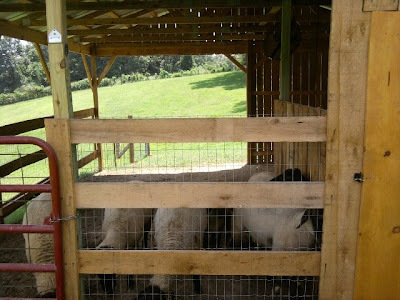 Hi Paula, I love the new sheep barn. You should both be very proud and how nice that you can sit back at the end of the day and view it from the house! Can't wait to read about the honey next. Enjoy your day. Wow I am green with barn envy!! 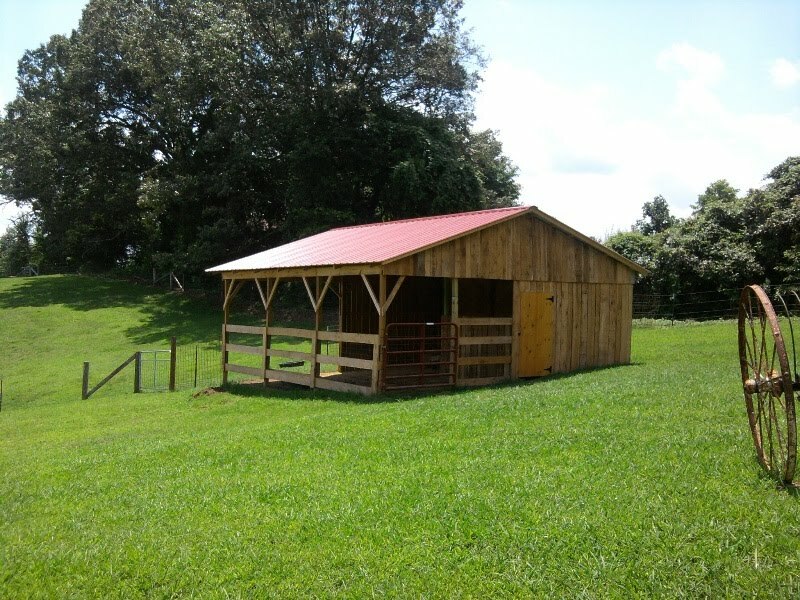 What a wonderfull barn for your sheep, with heaps of room for hay, other feed and everything you need. Well done to both of you. Aaaahhh, I love how well you take care of those girls. And, it wonderful that you and your hubby can watch them from you house. How peaceful. 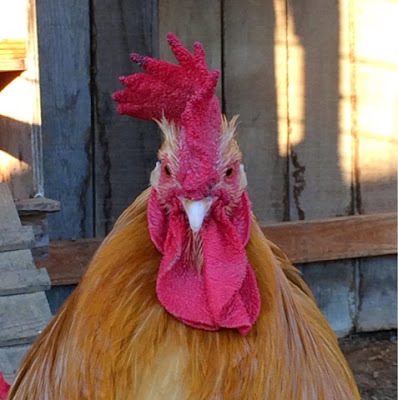 Looks like you live in a lovely place -- the barn looks great -- good job! very posh quarters - I'm not letting my goats see this blog post so they won't start picketing our metal 3 sided shelter which is their primary refuge. Love the new diggs!! Beautiful place you live. Beautiful! Paula, you live in a gorgeous area! Those rolling hills, the fields and trees.... Just breath-taking! Now that's what I call an efficient space. 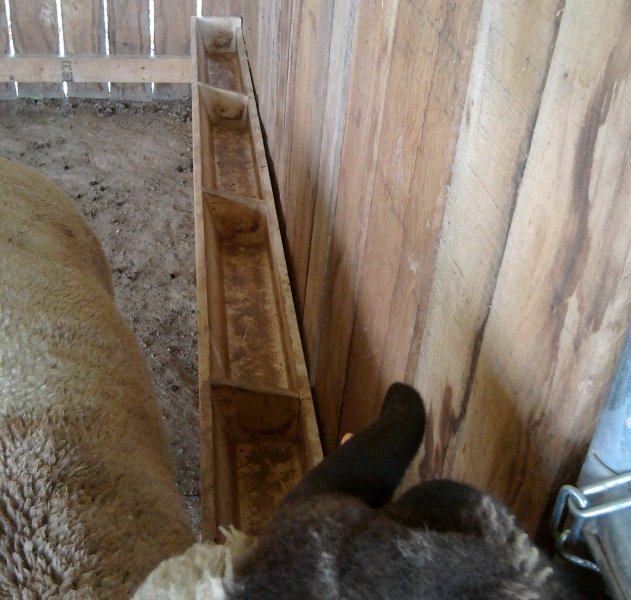 I love the feed trough. It's so nice that they have the protection too.....we have coyotes here too (pesky). Last but now least...girl, what a view,,,what a lovely view. 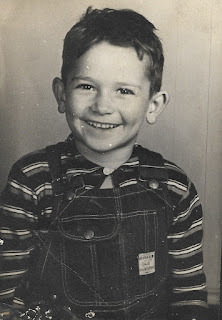 Blessings to the woolly group and you from the holler. It turned out beautifully!! Those sheepies are so blessed to have such a great mommy and daddy. What a beautiful sight to see in the evening, sigh. Makes me feel all peaceful inside. How well kept your farm looks! Isn't it nice to sit down and reflect on a job well done? They are some well cared for ladies. It turned out wonderful. Can a sheep barn be beautiful? I think yours is. Your hubby did a great job on the sheep barn. What a great home they have there. 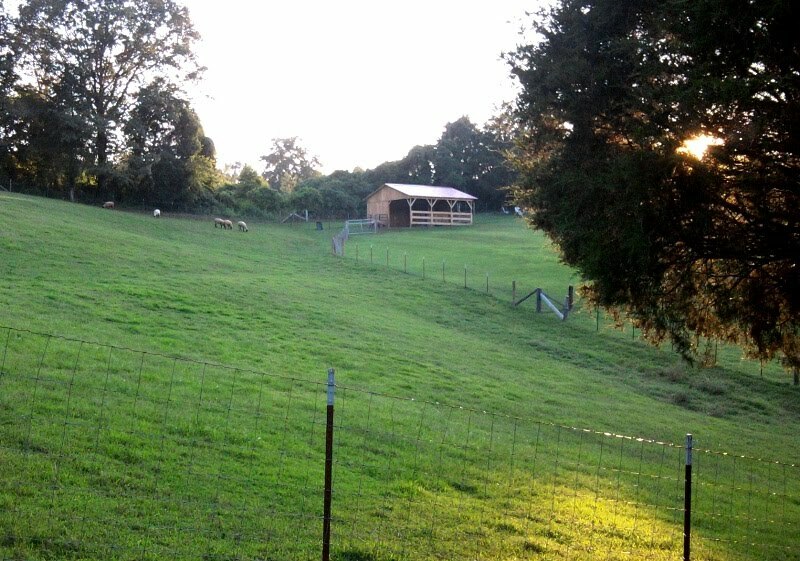 Your property is beautiful with the green rolling hills. I am coming back in my next life as a sheep so I can come and live there. lol. Super pictures---you covered it all. Those are some lucky sheep. Their new home is so pleasant on the eyes, too. Loved the last shot showing the pasture and the new barn. You are so good to the animals! NICE JOB!!! They are really gonna love it. I love that you can watch them from your house. Beautiful! Lucky sheep. Thats some big time points your hubby won. I don't know who is more excited about the new barn, you or the sheep. I think they will really be happy when winter sets in and they are a nicer place to hang out. I hope someday I will be able to post that we have happy sheep too! So jealous! What a great barn for the sheep! They must be very glad for their new home! Your green grass is something else..I thought sheep ate it all? Your hub sure know how to make you happy!! Can't wait to see the honey crop!! Beautiful barn, Paula! And those sheep don't even know how good they've got it! Well, we'll be all proud for them, K? It looks great, all safe and sound and cozy for summer and winter! I know you're thrilled to have it done, and all in plenty of time before cold weather comes back! Congrats! Your hubby did a great job! Just beautiful! What a pleasure to be able to watch them at the end of the day. Job well done! That last picture looks so peaceful,what a wonderful view from your house. 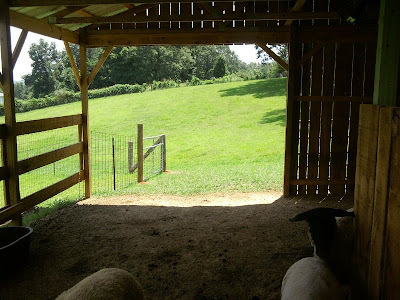 The new barn is really nice and those sheep will surely appreciate it this winter if we have another one like last year. Wow! What a lucky bunch. That's the best sheep barn ever. I hope they saaaaaid thaaaaaank you! If I were going to be a sheep, I'd want to be a sheep on the Fraker Farm. That is a mighty fine home they have there. I always love seeing your pictures. What a fantastic home they have!!! I love it! And each of them is so cute, as well! 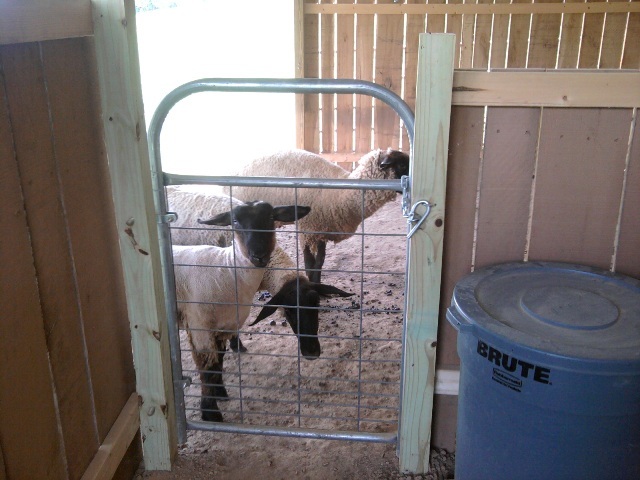 Paula, your sheep barn is wonderful! Fraker Farm looks great, and you have gotten so much done----I feel like a complete slacker; I didn't even get around to picking the blackberries this summer! "I just love what you have done with the place". I am sure that is what the sheep are saying. Great job on all your hard work. I always enjoy the pics of your farm. Looking forward to hearing about your honey. Wow! You really know how to treat the sheep! 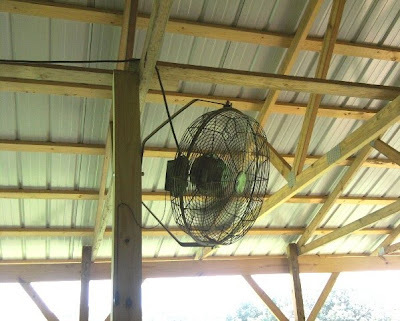 LOVE the new sheep barn and the fan! Nice! The sheep sure have a great barn. What a lovely farm. The land is really pretty. I can imagine the sheep are enjoying the fan and trough. Great posting. Hello dear one.. I found your comment-thank you soooo much.We might meet up-you never know!!! Wow! That is a nice new home for them! I love the shady porch part, I'll bet they enjoy that a lot! Y'all did a fantastic job! I feel like I have had a proper visit to a gorgeous farm! Loved your past posts, and enjoyed catching up on all you've been doing. What a great barn, Paula! Your place is so pretty and neat~I love when you share pictures! Hope you guys have cooled off some over there. We are still HOT. Nice job. It looks great. The sheep are very lucky!